Apparently there’s a similar shortcut for Windows XP, “left-shift, left-alt, print screen”, which allows you to switch into a high-contrast mode (also accessible and configurable via the control panel)? I wouldn’t know, I don’t have Windows XP, but if you do you could try that. I know you can’t compare apples and oranges, but perhaps we *can* compare apple juice and orange juice! There is one problem: most people have never had good, fresh-squeezed orange juice or apple juice, and it’s not really fair to compare inferior examples of the two. 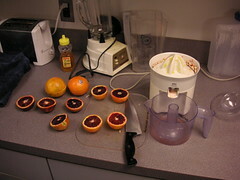 I personally try to have some fresh-squeezed orange juice every day, but juicing citrus is easier / less messy than squishing apples, and I didn’t have a Champion-style general-purpose juicer at college, while I did have a citrus juicer. The result is that I have better memories of good fresh orange juice, and I am prejudiced against apple juice. I know this story was on Slashdot (Bruce Schneier Blasts Politicians, Media), so some of you have seen it already, but I decided to reproduce it in its entirety because it reflects perfectly my own feelings on the subject. What ever happened to “We have nothing to fear but fear itself?” I think that the people who support giving the government ever-increasing power to invade our privacy and control our lives in the name of the war on terror are the worst kind of cowards. Terrorists can kill us, but they can’t make us give up our liberty and our way of life, only we can surrender that. My personal favorite example showed up on BoingBoing a couple of months ago (US bans sale of chemicals to hobbyists without $1K license)… After all of the work we put into getting people enthusiastic and educated about science during the Cold War, are we going to prevent people from learning chemistry in the name of the war on terror? As a fireworks hobbyist who likes to use chemicals to make pretty things, I find the increasingly absurd restrictions on chemicals to be personally threatening.